Our store is located at 23809 John R in Hazel Park. We are on the west side of the street 2 blocks south of Woodward Heights (Steve Fraser Blvd) or 9/12 mile road. Coming from the east on I696 exit at Dequindre Rd. 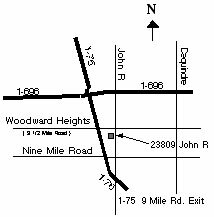 stay on the 696 service drive 1 mile to John R. Turn left (south) onto John R approximately 3/4 of a mile our store is on the right. Coming from the west on I696 exit onto I75 South. Stay to the right and take the first exit which is Nine Mile Rd. Turn left (east) onto Nine Mile Rd to the first main intersection which is John R. Turn left (north) onto John R. Our store is just less than 1/2 mile on the left hand side. Coming from the north on I75 exit at Nine Mile Rd. Turn left (east) onto Nine Mile Rd to the first main intersection which is John R. Turn left (north) onto John R. Our store is just less than 1/2 mile on the left hand side. Coming from the south on I75. Take the Nine Mile Road exit. Turn right (north) at the first traffic light which is John R. Continue north on John R approximately 1/2 mile. Our store is on the left hand side.